Today we’re talking business with Steve Thompson and his new book, The Irresistible Value Proposition. This book takes the least understood concept in business—value—and turns it into a powerful selling tool. Steve wants to make your value propositions irresistible and that’s what we’re chatting about today. How to make the customer want what you’re selling and want it now by clearly communicating your value in their language. Steve Thompson: My target audience here is the B2B sellers. The reason that I target them is about half of my business is working with B2B buying organizations to help them position and negotiate critical deals with key suppliers. As a result, I see what’s happening on both sides of this dance, if you will, of selling and buying. This is one of the key pain points that I brought up in my first book Must-Win Deals, and what I’m doing in this one is laying out for the sellers, how can you put a truly irresistible value proposition in front of a customer that will get them very interested in buying from you. Rae Williams: What’s the first idea or the first thing that you advise people to do to get these people interested? 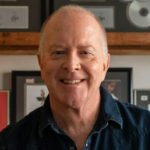 Steve Thompson: Well, to get them interested, you first need to understand that there is a difference between what customers are paying for and what they’re buying. Here’s an analogy that I use in the book. There is a gentleman named Theodore Levitt from Harvard Business School. He since passed away, but I thought he was just really brilliant, and an insight that he had was that people don’t buy a quarter inch drill, what they buy is quarter inch holes. They’re buying the outcome, they’re paying for the tools. The first key thought for any seller in a B2B situation is you need to ensure you’re not confusing what they’re paying for—which is your products and services—with what they’re really buying, which is an outcome or maybe more than one outcome. It’s determining what those outcomes are that are going to allow you to develop a truly irresistible and unique value proposition. 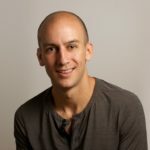 Rae Williams: How often, you said you’ve seen this happening over and over, how often was it happening, and what was the result if you are not getting these customers interested? Steve Thompson: Well, the inverse is then the customer’s really not excited about buying, and as a result, if deals get done, they take a long time, they tend to become very price sensitive when you get to the negotiation. They’re generally not good deals for the buying organization or are there really good deals for the selling organization. You know, that’s one output. Now, you ask, why would these things be delayed? Well, typically, if you’re selling into a large B2B organization, there are going to be multiple buying influencers and you’re relying on the people you primarily deal with to sell you internally. Instead, if you would flip the script, if you will, and start with the customer outcomes, that’s really what they’re buying, maybe what they’re buying reduce cost. Maybe they’re buying increase speed to market. Improve customer satisfaction. Those are all outcomes and when you can couch it that way. You’re also helping your internal champions sell for you internally. I’ve got a theory that, for some reason, when we get into sales, things that we naturally do when we’re buyers, it’s like somebody puts a steel plate in the middle of our head, okay? We don’t think these things are important now. Let me give you an example. Let’s say that you are going to a family reunion or maybe it’s a class reunion or it’s a wedding of your best friend and you’re going to the hair stylist to get your hair styled. Do you really want to talk about the various clippers and scissors and you know, could be gels, lotions, whatever the case may be that he or she is going to use or do you want to ensure that they understand exactly how you want to look when you walk out the door? One more buyer—that’s what we’re focused on, this is how I want to look. I don’t really care what tools and things you use to get there. When we’re buyers, we will do this naturally. But when we’re selling, we tend to focus more on the what they’re paying for, as opposed to what they’re buying which is the outcome. I see this a lot with my clients in the technology arena. They’ll spend a lot of time talking about their software or the hardware that they’re selling, various features and functions. While that’s great, it’s really not that interesting to the customer. What the customer wants to understand is, if I buy this, what is it going to do for me and my business? And if we don’t connect those dots early, it becomes very challenging for the customer to get excited like I say about buying. Rae Williams: Give me an example of a success story—someone has that has applied these principles that has spoken to that buyer instead of coming from a selling point and just done it really well. Steve Thompson: I’ll give you one that I reference in the book. This is a situation, it was during the 2008/2009 financial crisis, there was an international shipping firm who saw their shipping volumes drop to the around the 2001 recession levels. They put a freeze on hiring, they cut all budgets across the board by something like 30%, and they stopped building their IT data center. Well, the reason they were building the data center is because they were running out of storage, they were generating as a business a tremendous amount of data for tracking packages, collecting signatures, things of that that nature. Here’s the situation, okay? The chief information officer, it’s commonly called the CIO for this company, he was looking at being able to support the business for about another two and a half months before he was a going to run literally out of storage because they halted the construction of the new data center. We understand your number one priority is to be able to support the business with your current infrastructure. Well, with our software, we believe that we can recover about 27% of your current storage because you’ve got a lot of duplicate files in there so we remove duplicates. In doing so, you’re going to be able to support the business for the next 20 to 24 months with your current infrastructure. This ended up being—I don’t remember exactly, it was around three and a half million-dollar sole source deal that literally got closed within a week. The reason it got closed. Now, the CIO did not care about the technology or the features or the names of the software that was being installed, what he cared about was the outcome. We could recover 27% of his current storage and we could give him another 20 to 24 months of supporting the business. That’s one that’s focused on the outcome, not on the product. Rae Williams: Are there specific sectors, specific people that can really benefit from this and should focus more on this? Steve Thompson: Well, I would say, given the breadth of my clients, probably the technology arena could use this more than most industries. In technology, there’s always new developments and new technologies that are launched. Everyone gets really excited about them and that’s great. But we tend to go sell too much on the technology, on the features and that sort of thing. We’re making it harder for the customer to buy. To answer to this one in succinctly, you know, this really applies to B2B sellers. I think predominantly in the technology arena is where it applies. I will tell you probably the most misunderstood concept in business is just this term of value. It is used and abused to the point where people truly don’t understand what is value in the B2B sense. Maybe that’s a question we ought to answer first before we get into the value proposition. Rae Williams: In your opinion, what is value? Steve Thompson: Value is a term that you know, everybody uses to the point where it really doesn’t mean anything or it could mean a thousand things. Here are the attributes of value that you need to understand. Number one, it is always specific to a customer’s situation, and the value is an impact associated with the outcomes that you’re trying to achieve. For instance, if a customer is trying to reduce cost, well it’s, what cost, by how much, and by when? Now we’re getting into quantifying it and we’re getting an idea of what the impacts are, because this individual may have a bonus or promotion tied to it. Then, probably the most critical thing to understand about value is, it’s anywhere and everywhere, incremental to whatever the customer’s alternative is to you. It’s just the incremental that’s the value. To make that point clear, let’s say you are going to buy a new refrigerator and you go to one retail establishment and/or dealership if you will, and you found the exact make and model you want with all the features. The color, the décor is going to match your kitchen perfectly, and they have a price of let’s say $1,500. And then you shop around a little bit online and you find another retailer that’s not that far away selling the exact same refrigerator, same model with the same features. Let’s say they are going to provide the same services of pickup and delivery and hauling off your old refrigerator, but their price is $200 cheaper. Now what is the value? Well the value is that incremental, the $200 you saved. When we are buyers, we tend to understand that intuitively. But when we are selling, we don’t focus on the incremental as much. We tend to want to talk about everything, but it is just the incremental that is of the value. There’s, by the way, value to the business and value to the people that we are selling to. We need to think about all of those different dimensions. Back to the example I gave a moment ago about the CIO at the shipping company, he had some serious political issues he was going to face if his organization was unable to support the day to day operation of the business because they had run out of storage because that was the whole mission of the IT department. It wasn’t just the business issue of being able to support them. There were the personal issues that surrounded it for him. So when we think about value, we’ve got to think about what is the context. What are the outcomes that are important? We have to understand, it is just the incremental we’re providing. Let’s assume that you are stranded on a desert island. You have been there a couple of days. It is a small desert island. There is no food, there is no fresh water, and I’ll admit. This may be a bit of an extreme example, but I think it will drive up the point home and you’re on the beach rearranging rocks in the international distress signal, SOS. I come hovering over you in my helicopter and in my hand, I have a bag with $2 million worth of diamonds, and I drop it at your feet. Now what’s the value to you? Well you can’t spend the diamonds, you can’t eat them, you can’t drink them. The value is zero. Now I do have some clients that say, “Well, at least I will die rich” okay? But then in my other hand, I have a big sack of groceries, bottled water, fruit juices. It costs me $200. At your feet, what’s the value to you? It’s more than the diamonds. But the problem is that as sellers, we tend to come into situations already in our mind we believe we understand what the value is. In this case, I thought the two million dollars because I could take those diamonds virtually anywhere in the world and get the equivalent of two million US for them. I thought that was the real value to you. But you see, I didn’t understand your situation. I didn’t understand the outcomes are important to you, and I certainly didn’t understand the alternative—which was if I didn’t get you what you needed, you are going to die. The $200 worth of groceries, bottled water, fruit juices, that is much more valuable to you than the diamond. But you could only see that by understanding the other side’s situation. Rae Williams: You are saying that you need to know the outcome as well as what the situation therein is. So how do we begin to understand that as sellers? Steve Thompson: Well, a couple of things to sellers. One is look particularly in the technology arena. Sellers are trained extensively on the products and services that they sell, and they do need to understand those things. However, they tend to want to talk about them first. Instead, what they need to do is the basic research. You need to understand your customer. 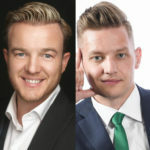 You need to understand how their business operates and you know, in the world of technology, in the ear 2019 when you think about a business’s data and then their applications, how important are they to the business. On a scale of one to ten, they’re a ten. 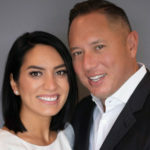 The expectation is their data and applications aren’t going to get less important as we move forward but if you as a seller don’t understand what is the data, what are the critical applications, how does this customer use them to run their business? Then you are going to have a challenging time elevating the conversation to talk about what are the outcomes that are important, and as a default, you tend to go in and talk about your products, your features, your function. Now I can get all excited, because that is something that I sell. So what I’m really asking about are the outcomes. What is it we’re driving at specifically? What is it you want me to help you achieve? I think that if B2B sellers would step back and stop and ask those questions first, then you can really make your conversation about the products and services you sell very targeted to that individual. But again, don’t confuse what you were paying for—which were the products and services—with what they really are buying which are the outcomes. Just by asking these questions, we can start elevating them. If I am talking to an individual and they share with me, “Well these are the outcomes that are important” one of my follow up questions is always, “Okay, but who else cares about this?” What I am getting a sense of is who are the other buying influencers that we ought to be talking to. Because maybe if I am selling to you and you’ve got internal customers, I’d like to know what’s going to make them happy, because that is going to make you look like a hero. We want to build that into our approach. So, like so many things in sales, you know the best sales people that I’ve come across anywhere they don’t have all the answers but boy, do they always seem to have the right questions, and that is really what it is about at the end of the day. Rae Williams: Nice, so if you could issue a challenge to your readers, what would that be? 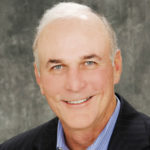 Steve Thompson: I understand selling in a B2B environment is complex, it is getting more complex every day. You’ve got very complicated solutions you’re selling. On the customer side, you’ve got all of these different buying influencers, and the deals are getting harder and harder to push through and close. Your job is how can you make it easy for the customer, like they are making an informed decision. And the first thing you have to do is get them excited about buying from you, and therefore you need to give them a value proposition that meets the following criteria. It is targeted. If one or more outcomes or priorities that are important to the key decision makers, shine a spotlight on that incremental because again, it is the increment that’s the value, and then third, don’t make it confusing for them to understand. Put it in their success metrics, their language if you will, and it will hit them between the eyes. It is easy for them to understand and it is easy for them to sell internally. If that’s what you’re focused on, you are going to start asking different questions. Because trust me, if you can’t clearly articulate your value proposition, I can assure you the customer is not spending a lot of time trying to figure it out. Rae Williams: Awesome, okay and how can your readers and our listeners reach you? Steve Thompson: Sure, they can reach me, number one, they can certainly connect with me on LinkedIn. I write frequent blogs on the topics involved in B2B selling and B2B deals. Also, my website is valuelifecycle.com, and I have a fair amount of material and videos on there that they can view and get more information about the things we do. Then finally, my email is steve@valuelifecycle.com. 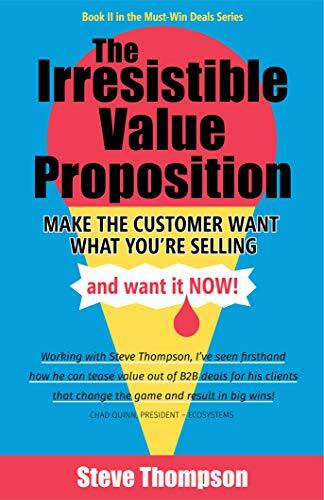 Get Steve’s new book The Irresistible Value Proposition on Amazon. Find out more at ValueLifecycle.com.